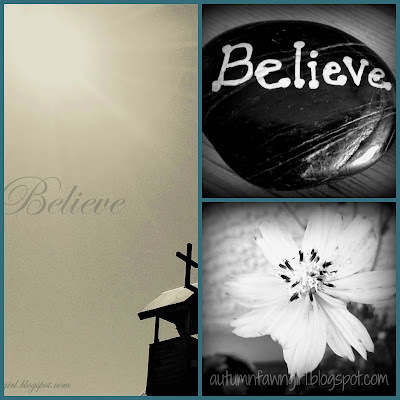 I think the word believe has been close to both my husband's and my heart for a while. It's been impacting my own life in a fresh, new way for the past couple of years. Even Christians need a nudge every now and then, especially when it feels like God is a million miles away, to keep believing. In the midst of countless trials, doubts, and heartaches, I am so thankful God continues to whisper His love over and over again. May this new song from my dh be a blessing to you! You can download for free on SoundCloud. 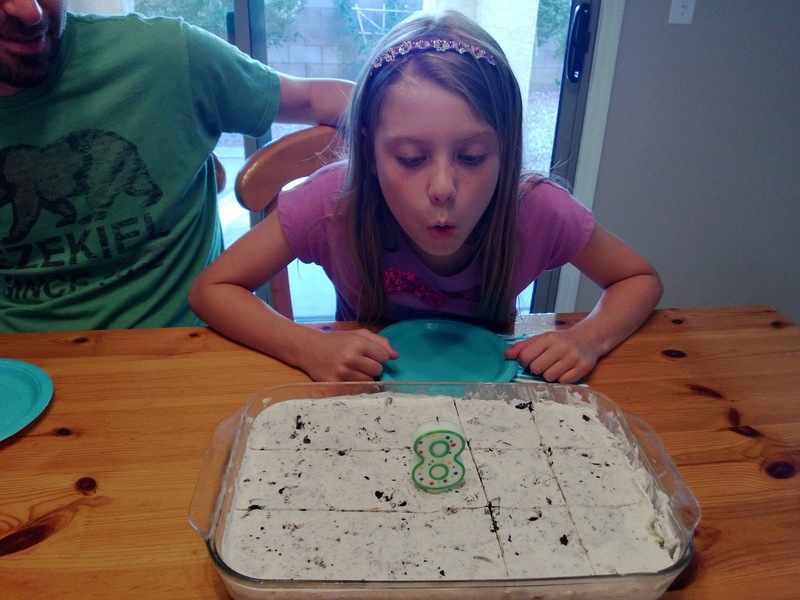 My dearest daughter, I hope you had a wonderful 8th birthday filled with lots of fun memories!!! Otherwise known as O.D. in my husband's family. 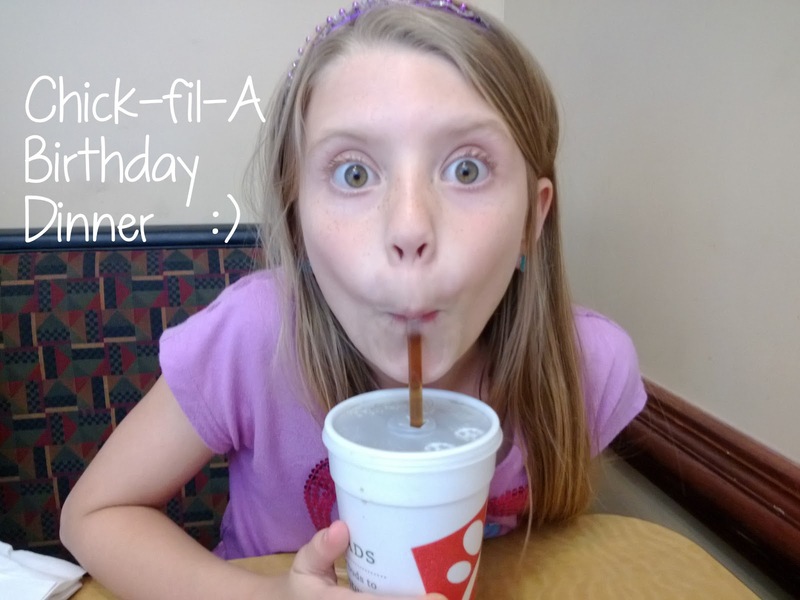 It was requested all of the time for birthday dinners at Pawpaw and Grandma's house in Tennessee. It is really easy to make. (I had to learn how when we moved away!) 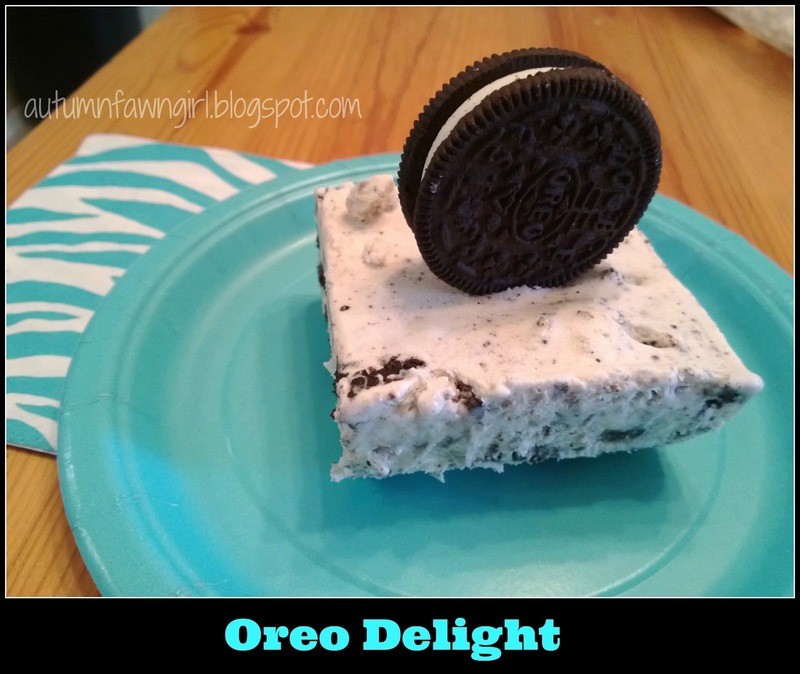 I have made a few minor changes because I am super picky about ice-cream brand and I don't like Cool Whip. Home made whipped cream (same amount as a Cool Whip tub) Or you could just use Cool Whip. **If you want to use the Late July cookies (in organic section of store), buy 2 boxes and use most of them in the O.D. leaving some out for garnishing. Also, to make home made whipped cream, buy heavy whipping cream and beat with an electric mixer until stiff. I add about a tablespoon or so of sugar to a pint. Visit Ben and Me for more O posts! 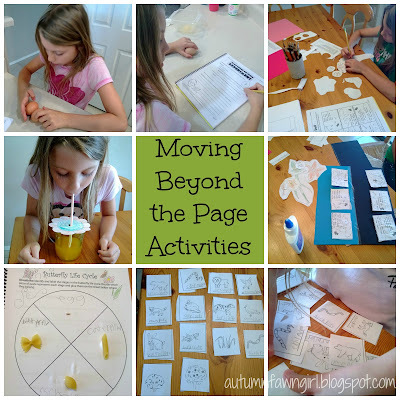 Moving Beyond the Page is a complete literature-based curriculum designed especially for homeschoolers. Unlike a traditional or classical approach to education which can often lead to boredom in some children, Moving Beyond the Page provides hands-on, creative, and gifted children with an exciting, integrated approach to learning. Through eight different strategies: (1) Concept-Based Curriculum, (2) Differentiation, (3) Learning Styles, (4) Multiple Intelligences, (5) Critical Thinking and Creativity, (6) Project-Based Instruction, (7) Interdisciplinary Curriculum, (8) and State and National Standards, this curriculum will help children become critical and innovative thinkers. Children will also be able to visualize connections between subjects when using Moving Beyond the Page's unit studies which blend science, social studies, and language arts. Art, drama, and music are incorporated as well. The overall goal here is to foster a love of learning and to create lifelong learners! Currently there are complete curriculum packages for ages 5-13. More ages are coming soon! Moving Beyond the Page sent us one Language Arts Package (unit) and a corresponding Science Package (unit) for ages 7-9. 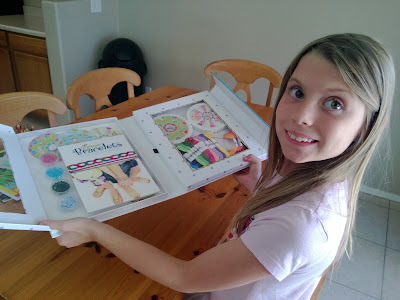 My daughter and I reviewed Concept 3: Lifecycles (Science Unit) and Poppy (Literature Unit). Both of these units can be used independently but are also designed to be used simultaneously. *As an exhaustive curriculum that covers an entire year, your child will explore four concepts, and within each concept, he will work through three science and social studies units and three literature units. The complete curriculum package for ages 7-9 costs $676.63. Online package is $587.96. These packages do not include math. Math can be ordered separately here. To use the curriculum for ages 7-9, your child should be able to read at a third or early fourth grade level, should be able to answer comprehension questions in a journal, and should be able to write three to four sentences on a topic. Typically, this age level is used by children in second and third grades. Personally, I would recommend it for third graders unless you have a particularly advanced learner. A typical day when using Moving Beyond the Page as a complete curriculum will take about 5 hours or more. This includes time spent on math, spelling, and P.E. Additional activities and further study may take more time. Of course, any of these units can be used as supplements. However, it is recommended that all three literature units be taught so your child can better connect themes and characters across novels. Just a quick reminder that I am only going to be discussing Concept 3 - Lifecycles and Poppy - in the 7-9 category. Poppy is a 161-page novel by Avi. 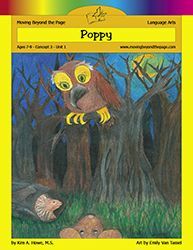 Poppy and the rest of her deer mouse family are fiercely ruled by a great horned owl named Mr. Ocax in Dimwood Forest. In exchange for absolute obedience, Mr. Ocax promises the deer mice protection from the terrible porcupine. When Ragweed, Poppy's fiancé, dares to defy the owl, he suffers the ultimate consequence - death. The rest of the story is filled with suspense and adventure as Poppy seeks permission from Mr. Ocax to move the growing deer mouse family and dares to disobey when her request is denied. Along the way, it is ultimately discovering the truth that leads to freedom from unjust authority. The accompanying online guide provides in-depth instructions for how to use Moving Beyond the Page including a video presentation. It also includes reading and question pages, student activity pages, a materials list, spelling words, and vocabulary words. Detailed lesson plans for each chapter are provided in this guide. Lesson plans cover Questions to Explore, Facts and Definitions, Skills, Materials, Introduction, Activities, Conclusion, and Life Application. Some chapters will take more than one day to complete, and this is noted in the lesson plans. Reading and Questions pages cover 2 chapters at a time. Worksheets can be downloaded and printed. Many of the questions ask how and why to help your child think critically. Spelling words are provided for each semester, and a sample weekly schedule is included for your convenience. Spelling worksheets are provided for Monday-Thursday of each week. In addition to comprehension questions, activity pages are provided for further research and fun. Activities include making puppets, writing a poem, practicing grammar concepts, doing crossword puzzles, researching about mice and owls, and more. My daughter, who just turned 8, was able to read Poppy on her own. Before she began, she completed the Deer Mouse Research and Great Horned Owl Research activity pages with my help. We had to use the Internet to find out about habitats, food sources, predators, etc. Each time she finished reading 2 chapters, we discussed the reading questions out loud together. I was able to learn a lot about the story this way! 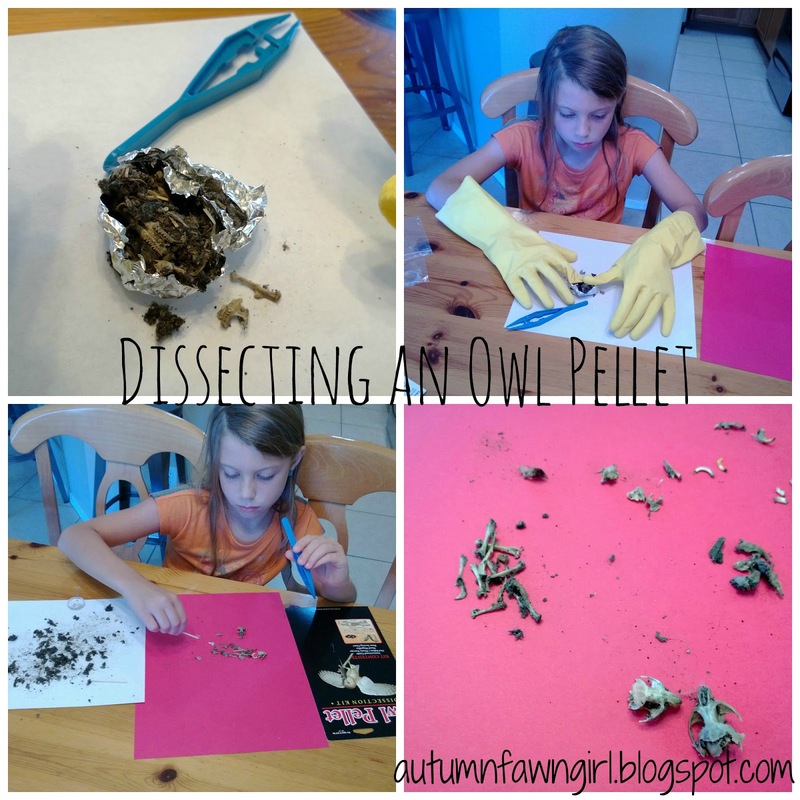 Our most memorable project was dissecting an owl pellet; this kit was included with the literature unit. She really liked reading Poppy and wants to visit our library to pick out more titles in this series. This literature unit has definitely fostered a desire in my daughter to learn more. :) I think that equals success! 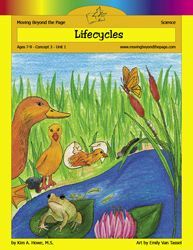 The Lifecycles Science Unit is comprised of a 124-page spiral-bound notebook. Included in the notebook are instructions for using Moving Beyond the Page, Required books, Materials List, Vocabulary list, Unit Review Sheet, and detailed plans for each lesson. Also, all worksheets that need to be completed by your child are contained within the notebook. Concept 3 contains about 40 days of instruction, but can vary depending on any extra time needed to spend on certain skills or on the final project. 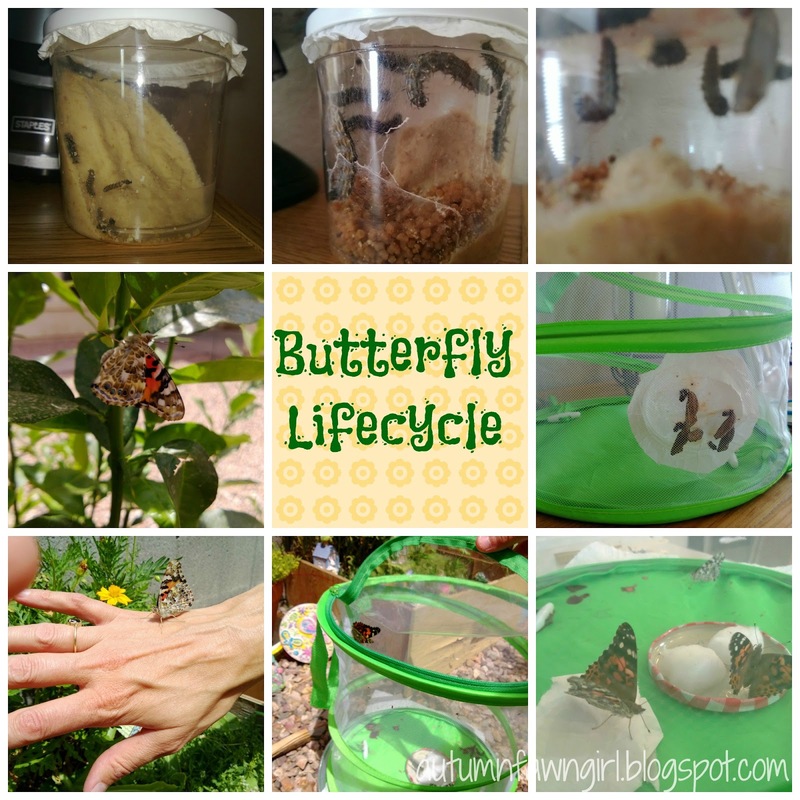 2: What Is A Life Cycle? Lesson plans follow a similar format to the literature unit: Big Ideas, Facts and Definitions, Skills, Introduction, Activities, and Life Application. For each lesson, the introduction tells you, the teacher, what your child will be learning for that day. It also explains what you will tell your child prior to the activity portion of the lesson. Each activity is explained in detail and any worksheets that need to be completed follow the lesson. Though there is a lot of information and work to be done, everything is presented clearly and in order. Lessons are very activity driven which is great for active, hands-on learners. Both my daughter and I can tire easily from too many projects, so we didn't always do every single one. Following is a sample of some of the activities we enjoyed doing together. The egg experiment from lesson 3 was really neat. We found out how to tell the difference between a fresh egg and a hard-boiled egg just by spinning it. This was a concept that was even new to me. :) My daughter also had fun depicting a butterfly life cycle with pasta, cutting out plant parts, making food chains, and sipping nectar from a flower with her "proboscis." I would have to say that the most wonderful and memorable of all the projects was the Green Earth Butterfly Kit. In fact, I am positive that this project is, by far, the best science project we've ever done! I can't tell you how exciting it was to receive live Painted Lady caterpillars in the mail. They came with all of the food needed to survive the caterpillar stage. My family (including my 2 boys and hubby) eagerly watched the caterpillars eat and grow every day. True to the butterfly booklet, the caterpillars attached themselves to the top of the cup after 12-18 days and began the chrysalis stage. After 8 days, the first butterfly emerged on Father's Day. The rest of the butterflies followed suit, however, one was deformed. It's wings stayed crumpled and never completely opened. My daughter appropriately named it Nemo. We kept the butterflies in captivity for about a week and fed them the recommended sugar/water solution. I even spied 2 butterflies mating, but we didn't have the privilege of seeing any of them lay eggs. We decided to let the butterflies go, and we enjoyed seeing them explore our backyard and eventually fly away. I think Moving Beyond the Page is a very creative and thorough curriculum. This curriculum is perfect for families who love unit studies with lots of hands-on projects. It also works well for parents who like to teach concepts that tie all of their child's subjects together and for parents who like to follow detailed, day-to-day lesson plans. 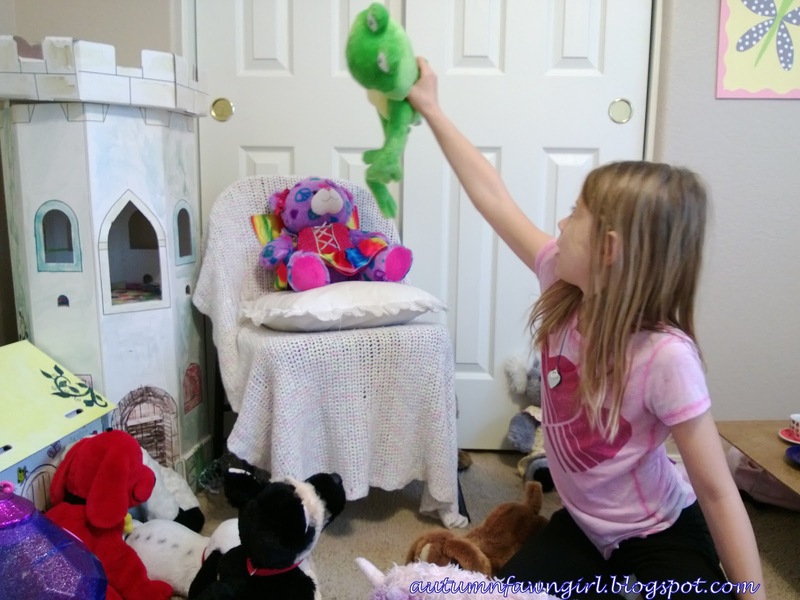 With Moving Beyond the Page, you won't have to worry that your child is doing enough. In fact, for me, there were too many projects within each lesson. It's not really a complaint about the curriculum, though, since I always adapt any homeschool subject/program to fit my own children's needs. Moving Beyond the Page will work better for our family as a supplement instead of a comprehensive curriculum for a couple of reasons. The cost for just one child to use the complete curriculum for one year exceeds our homeschool budget. We spend less than that on 3 children per year. Also, I like to teach history chronologically, so the social studies units wouldn't work very well for our family. Truly, though, this is a quality curriculum. If you like all of your child's subjects to be included in one curriculum package, and if cost is not an issue, I recommend that you check out Moving Beyond the Page. We enjoyed reviewing Lifecycles and Poppy, and I may look into other literature units for future use. Other Schoolhouse Review Crew members reviewed a wide variety of literature, science, and social studies units. Be sure to read all of the reviews! I've been thinking about iron lately since I've been dealing with fatigue. :( I am thinking I may need an iron boost soon to help with my energy levels! During my pregnancies, I would often suffer from anemia. I DID NOT want to take any unnatural pills, so I found an alternative. 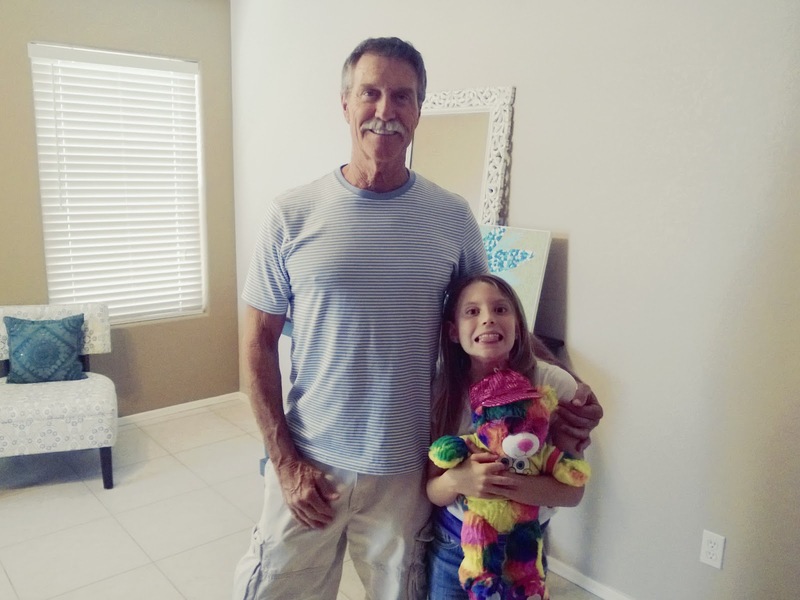 I had great success with an all natural iron supplement called Tri-Iron from TriLight Health. It contains Nettles, Yellow Dock, Red Raspberry, Dandelion, and Anise. All ingredients are certified organic, too. I also used several children's formulas from this same company when my kids were little. Visit Ben and Me for more of the letter N! 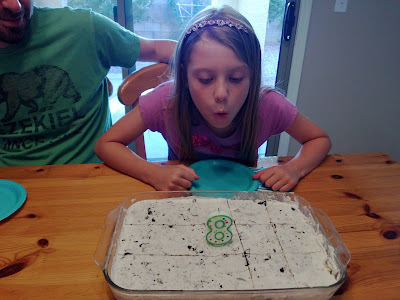 I just can't believe my baby is 8! 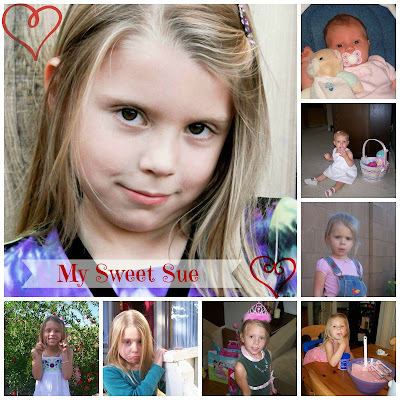 She doesn't want me to call her my baby anymore, but how can I possibly not do that? So thankful God blessed me with a sweet, little girl! 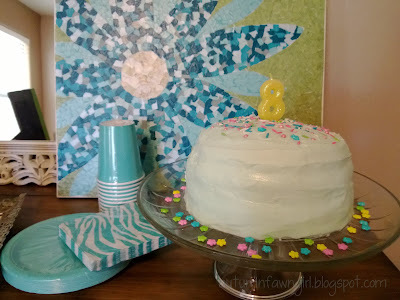 She was my shortest labor, HARDEST baby, and easiest child - still is so far. ;) Love this girl. 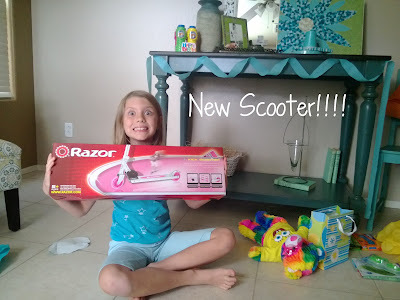 She's already been spoiled by several grandparents during the week . . .
Grandma gave her some art supplies and a Starbucks gift card which she redeemed THAT day! Grandpa took her to Build-A-Bear and Chick-fil-A. Her collection is becoming quite extensive. Grandparents from CO sent a fun friendship bracelet kit in the mail. Right now she is patiently awaiting her daddy's return from the Men's Prayer Breakfast so she can open her presents from us. Lots more celebrating in store for our birthday girl . . .
Prepositions are always fun words to learn. I love that words can have "relationships" with each other! Prepositions aren't just fun, they are necessary to learn. 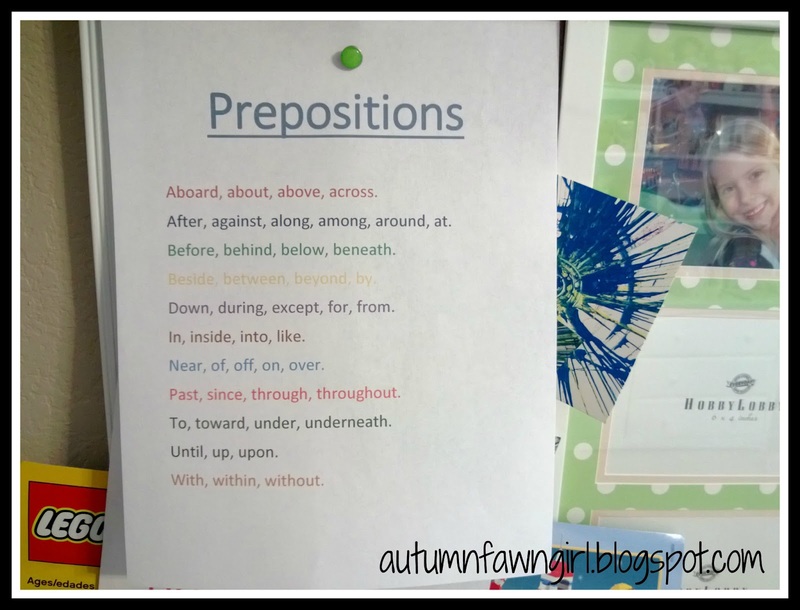 Knowing prepositions and prepositional phrases will help children be able to quickly identify subjects and predicates later on. 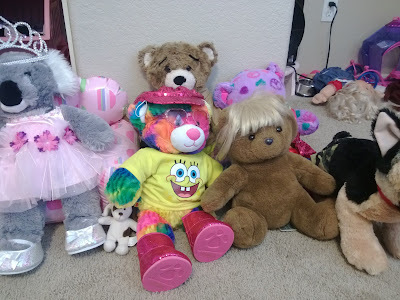 Also, inspired by one of the preposition lessons in the book, my daughter and I had tons of fun setting up a little stuffed animal kingdom to illustrate relationships or positions of nouns to other nouns. 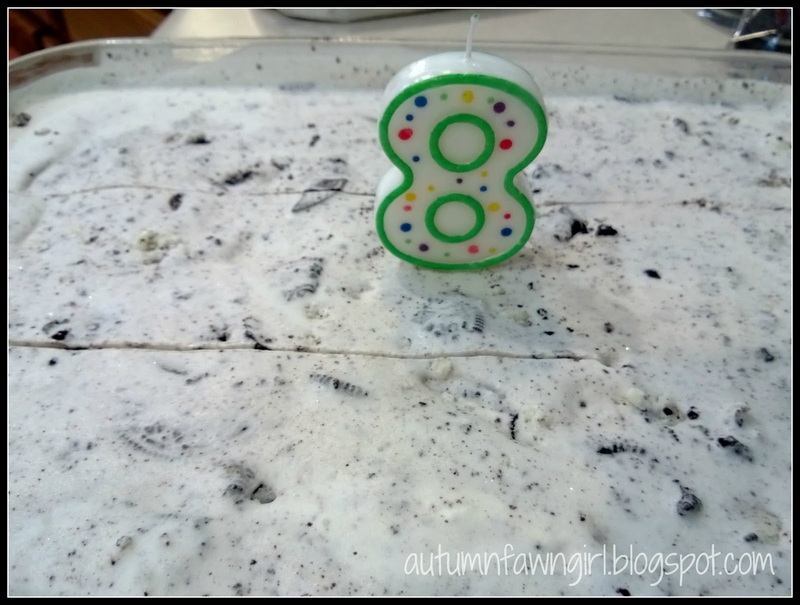 :) I am sure your kids would have fun with this, too! Queen Peace is sitting on her throne. Her subjects are gathered around her throne. Froggy is beside Minnie the Koala. Lily the German Shepherd is between Clifford and Uni the unicorn. The queen wears a sparkly crown upon her head. 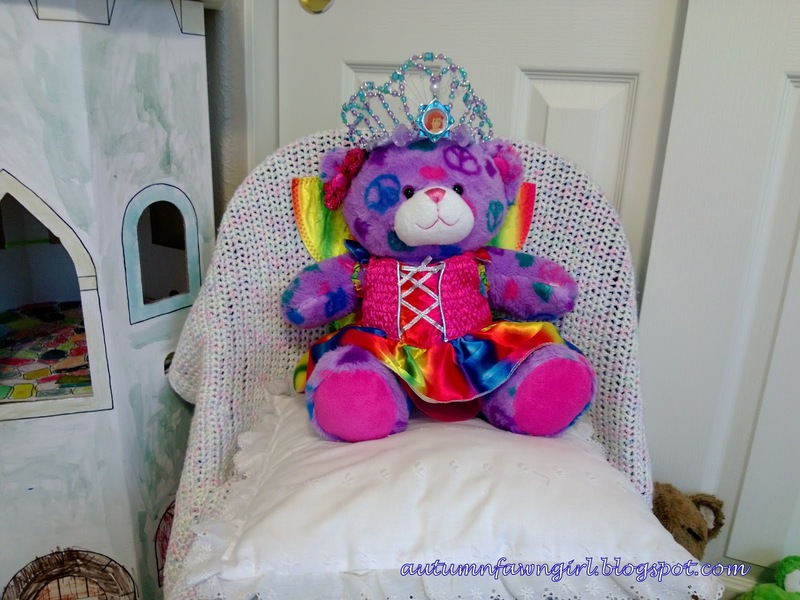 Froggy jumps over the queen's throne. Froggy is above the throne. Click here for a printable preposition list for your child to memorize. 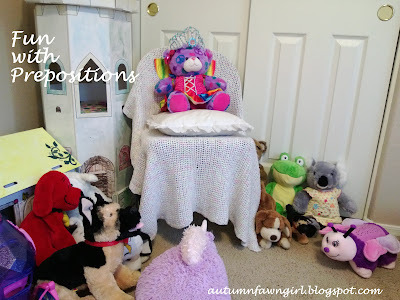 Do you have any suggestions for learning prepositions in a fun way? Pin It Now! This post is no longer available on Blogger. Please visit my new site to view the post, How to Write on Rocks. Thanks! Baker Publishing Group sent us two of their books to review: Life with Lily and A New Home for Lily by Mary Ann Kinsinger and Susan Woods Fisher. If you're looking for some wholesome books for your daughters to read this summer, I think these two books that are currently in The Adventures of Lily Lapp series are great choices. 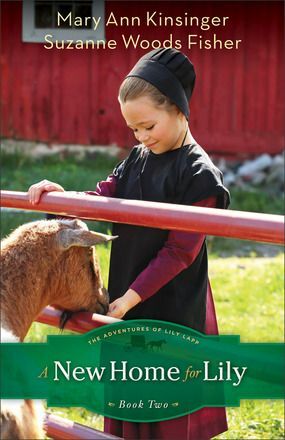 They're simple, sweet stories featuring a bright, young 5-year-old girl growing up Amish. In Life with Lily, we meet the Lapp family - Papa; Mama; Lily; Lily's younger brother, Joseph; and a brand new baby brother, Dannie. They are busy establishing their little farm, Singing Tree Farm, in upstate New York. 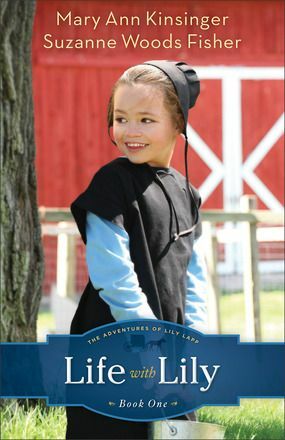 As I read this book aloud to my almost 8-year-old daughter, we learned all about daily Amish life through the eyes of the main character, Lily Lapp. 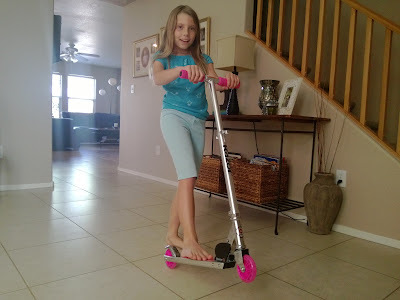 Her days are spent simply enough helping Mama with chores, entertaining her brothers, taking care of animals, meeting new friends, and playing with dolls. But just like everybody else Lily Lapp faces lots of challenges, too. 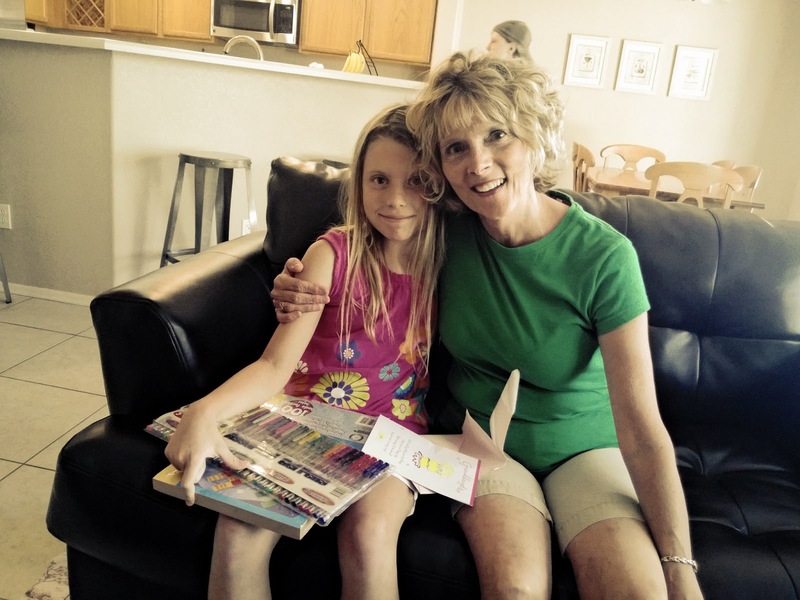 Mandy Mast is always trying to get her into trouble, Teacher Katie is just plain mean, and Great Grandma is scary with all her wrinkles and her giant cane! At the end of the book, Lily, who is now 7, is faced with the sad news that her family is leaving Singing Tree Farm to move to Pennsylvania. See the Table of Contents and read the first three chapters. As I reached the halfway point in Life with Lily, I realized that I wasn't going to be able to read both books aloud during the review period which for me was just under 3 weeks. So, I asked my 11-year-old son to read and review the second book, A New Home for Lily. While I wouldn't recommend these books specifically for boys, they can certainly read and enjoy them if they want to. See the Table of Contents and read the first 2 chapters. Both books have several charming black and white illustrations throughout. While both books are recommended for ages 8-12, my daughter, who will be 8 in a week, felt a little intimidated by the number of pages. She hasn't really read books this long yet and didn't want to read them on her own. I enjoyed spending time with my daughter while reading the first book aloud, but I personally wouldn't want to read these books on my own. I would definitely recommend these books for children since they are written from a child's viewpoint. 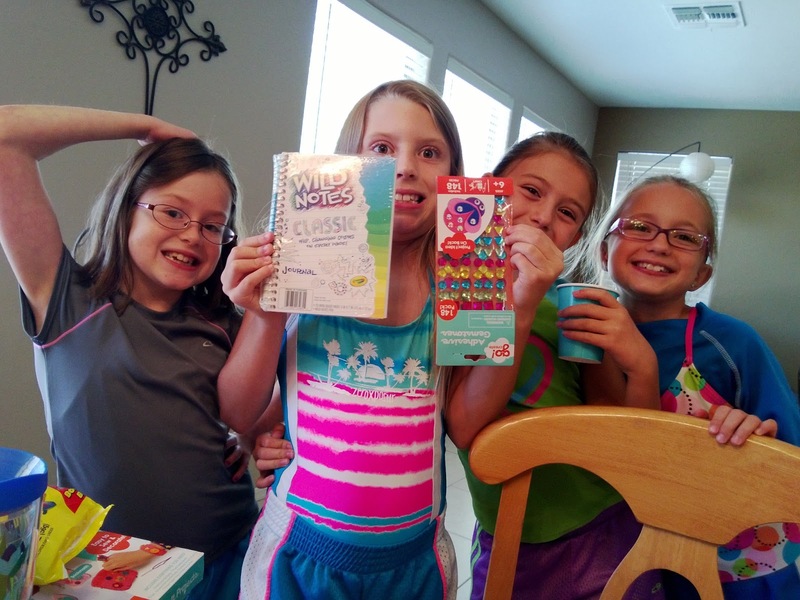 The fun and adventure doesn't stop with the books! 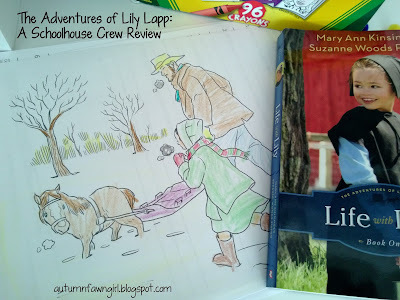 You and your child can visit www.adventuresoflilylapp.com to meet the authors; learn more about Lily, her family, and the Amish; print coloring pages; try recipes; ask questions; and more. My daughter enjoyed coloring a picture of Chubby, Lily's little horse. I think it's really neat that both of the authors have Amish ties. Mary Ann Kinsinger was actually raised Old Order Amish in Pennsylvania, and Suzanne Woods fisher has many Amish relatives including a grandfather who was raised Old Order German Baptist. They certainly have a lot of knowledge and experience with Amish ways which I am sure helped to create such a realistic view of Amish life in these books. 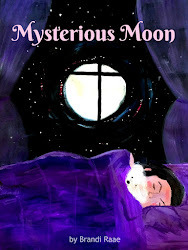 The Adventures of Lily Lapp continues with 2 more books: A Big Year for Lily available in July 2013 and the final book, A Surprise for Lily available September 2013. 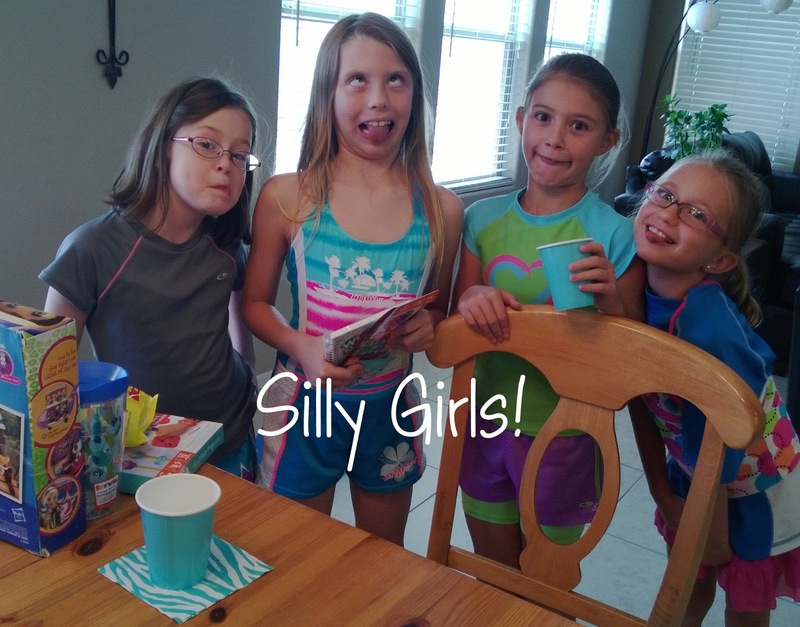 Summer can be pretty boring at our house. It's hot, and there's just not a whole lot of free stuff to do. I am so thankful for Mixcraft! It's been keeping my boys entertained, and they have something to show for all of the hours they spend on it. 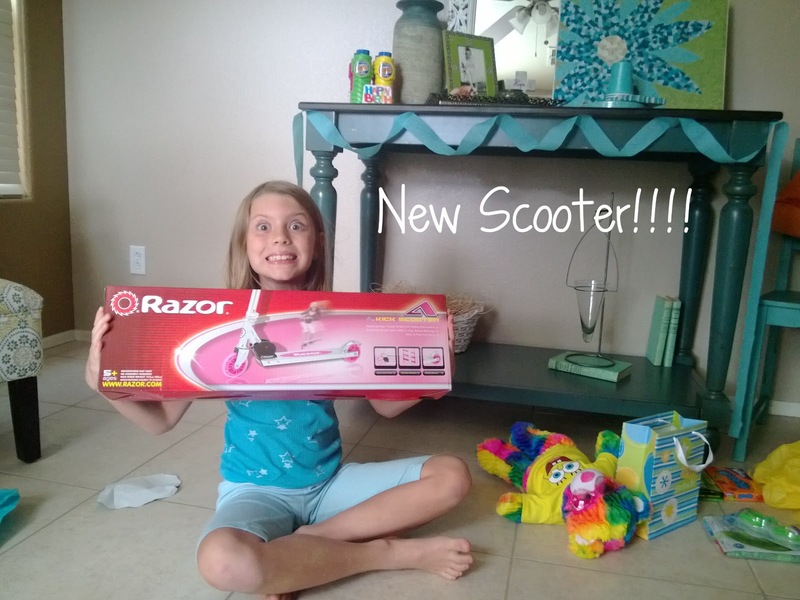 If you have kids who love music and would enjoy making their own stay tuned! Mixcraft is a tool ( audio editing software) in which you can make your own music using loops and/or your computer keyboard as an instrument. There's a limitless amount of cool things you can do including changing key, pitch, adding effects, and so much more! You can even record your own instruments and your voice if you want to through Mixcraft. You can also download loops off the internet and put them into Mixcraft. You can upload a video to Mixcraft and put music to it. You can spend as much time as you want tweaking your track until you get it just right! To use Mixcraft, you don't have to know how to read music, and you don't have to know how to play instruments. Both my boys have a lot of fun making their own music with Mixcraft. Neither one can read music. Only my oldest has actually recorded himself playing his own instrument. Now, I have never even used Mixcraft , but my boys spend hours messing around and creating some fun stuff! Because I don't really know much about it, they helped me to understand how it works. Once you have finished making your track, you can save it as an mp3 file. Then, you can listen to your own creation any time you want. If you want to be able to share it with others, SoundCloud is the place to go! SoundCloud is a free website where you can share your music with others. Basically, it's a social media site for music lovers. With SoundCloud you can have followers and follow other people and listen to their music. My husband and sons all have music on SoundCloud. Take a moment and listen to a few of their awesome creations! He loves to make silly songs about soft drinks. Here's his favorite one about rootbeer. He recorded his own voice for this track, but obviously it's been tweaked a bit! He is definitely on the more serious side and has created quite a few pleasing melodies. I chose this particular track to share because it reminds me of when he was just a little guy marching around the house to In the Hall of the Mountain King by Edvard Grieg. He and his brother always thought this classical piece sounded like a Lord of the Rings battle. He is playing his own piano keyboard, but the rest of the instruments are from Mixcraft. Here's a song that my husband recently recorded which was produced by our friend Austin. My husband is the guitarist and vocalist. 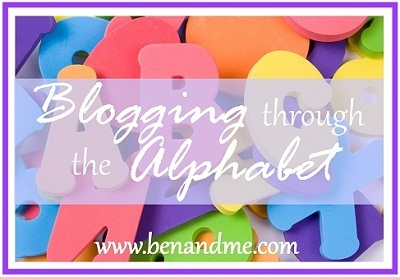 Yea, we're halfway through the alphabet! 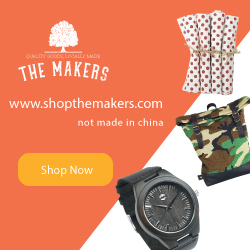 Visit Ben and Me for more M posts. If you're looking for a Geography curriculum in which the primary goal is for your child to be able to master the identification of countries and their capital cities, then Geography I from Memoria Press is a must see! Memoria Press sent members of the Schoolhouse Review Crew their Prima Latina and Geography I curricula. 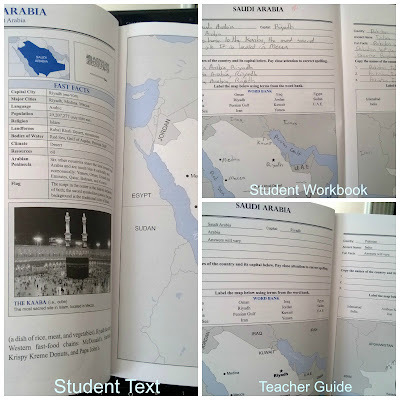 Our family received Geography I to review. I was already familiar with this excellent company since my oldest completed Prima Latina, Latina Christiana I, and Latina Christiana II several years ago. Naturally, I expected great things with their geography products. I wasn't disappointed in the least! For the best value, you can purchase the entire set for $48.00. However, each book can be purchased individually for the prices listed above. 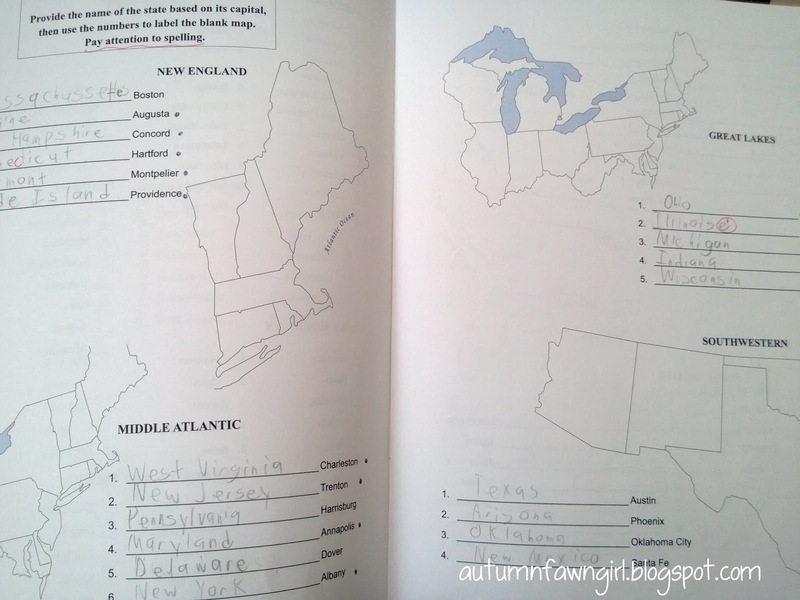 Before your child jumps into Geography I, it is recommended that he complete the included United States Student Workbook first which reviews in detail states and capitals. It's assumed that your child has previously studied states and capitals with Memoria Press. Even if he hasn't, using these books won't be a problem. Section I - Student identifies states by region on maps. Section II - Student matches capitals of all 50 states by region. Section III - Student provides name of state based on its capital and labels maps by region. 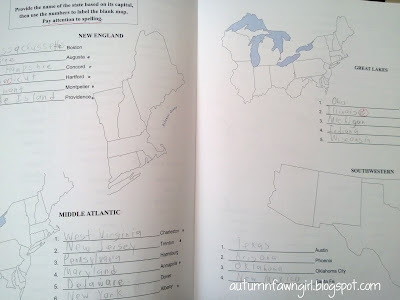 Section IV - Student identifies states and capitals by referring to numbers on a map. 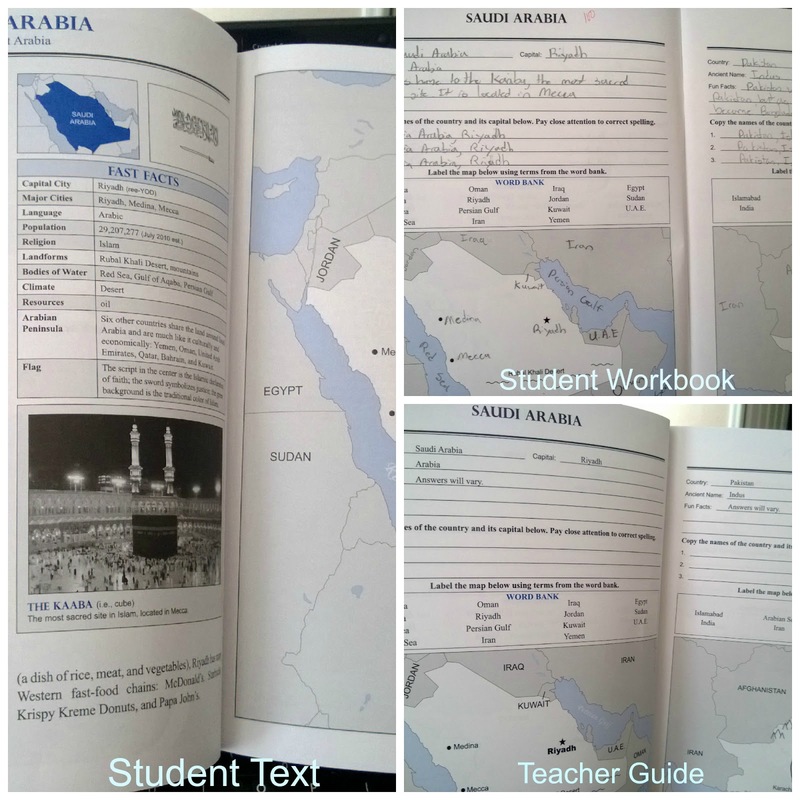 Click to view a sample of the United States Student Workbook. 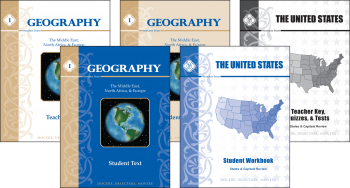 The meat of this curriculum is the study of the Middle East, North Africa, and Europe, and I gave these books to my eighth grade son who'd been complaining that he didn't have enough geography in his schedule. We mostly do geography on Fridays which consists of doing one map based on our history lessons for the week. I do admit that when time is an issue, geography is the subject that gets cut. Geography I has really been great for my son! This curriculum is so much more than identifying countries and capitals. Before your child even begins filling in information on a map, he reads an introduction to the country being studied. For each country, your child will learn about interesting facts such as resources, climate, and population. Also for each country, "History's Headlines" spotlights the role the country played in history, and "Tour of Today" captures the present. Comparing the past and present of a country's history really deepens understanding and helps your child see the whole picture. Following this schedule, your child could finish the book in about 20-25 weeks, give or take a few weeks depending on how much time he would need to study for quizzes and tests. To see the high quality pages for yourself, you can click the link to view a sample of the text, the Table of Contents, and a workbook sample. Many black and white photos and illustrations are included in the student text, but there's an option on-line to be able to view all of the images in color! If you plan to use this curriculum for more than one child, you will need to purchase a separate workbook for each child. Pages in the workbook are not reproducible. Only tests and quizzes in the Teacher Guide can be copied for multiple use. My son completed the entire Middle East section and says he really likes this geography curriculum. The workbooks are attractive and high quality. Information is clearly presented and follows a predictable format. I, too, am very satisfied with this curriculum, and I think children of all learning styles would do well using these books. I will definitely choose Memoria Press to meet our future geography needs! This post is no longer available on Blogger. Please visit my new site to view L is for Lighten Hair Naturally with Lemon Essential Oil. I've had this printable in my closet for a few months thinking the font colors would look great in my entryway room. And of course the message is wonderful as well! I just didn't have a frame to put it in, so when my daughter said she didn't want her baby pictures in her room anymore, I used it. 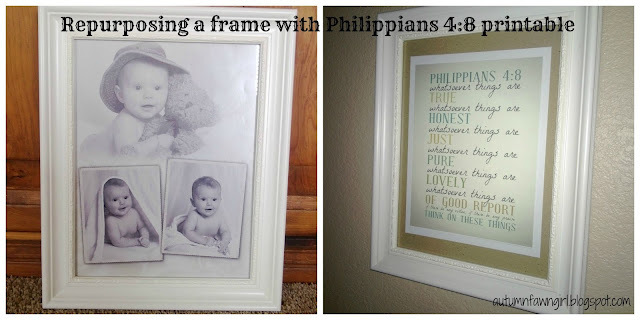 Perfect - free printable and free frame. Only the frame was too big. Solution: I used the cardboard that came with the frame as a matte. It works. 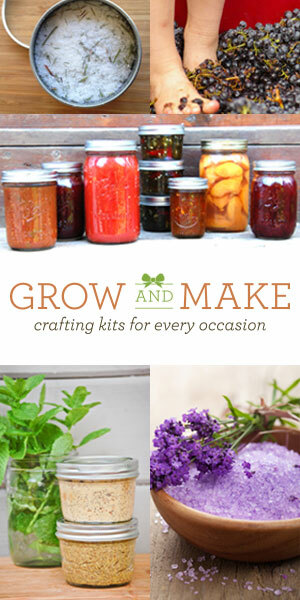 Click if you'd like to download this lovely printable.